A number of specific conservation projects within the Region undertaken mostly through funding provided by extra-budgetary resources. The projects financed with extra-budgetary resources form an essential part of the Action Plans for World Heritage in the Region. They support several conservation and management activities, which cannot be supported only with regular budget funds. Thanks to the substantive and financial support of a variety of donors and partners, the Latin American and the Caribbean unit of the World Heritage Centre (WHC/LAC) is able to enhance its action regarding conservation, management, technical assistance, seminars, workshops, training courses, database creation and others. The following projects were proposed as part of the overall strategy for the implementation of the Regional and sub-Regional Action Plans for World Heritage discussed with the State Parties during the regional and sub-regional meetings held in the course of 2014 and 2015 for the period 2014-2024. After a consensual agreement the said Plans were submitted and adopted at the 38th and 39th session of the World Heritage Committee. Moreover, a Program of Pilot Projects in South America (PPPAS) was established in the framework of the elaboration of the Action plan for World Heritage in South America (PAAS 2015-2020). The preliminary projects selected by the State Parties for this strategy aim to reflect their efforts to efficiently address the main difficulties identified in the PAAS and to contribute to the concept and dissemination of successful experiences and best practices for the conservation and management of the properties in the sub-region. In general all the States Parties show full commitment on the implementation of their respective Action Plans. In this sense, the implementation of pilot projects for the region is a real opportunity to strengthen the participation and social inclusion of local communities in the decision-making processes for the management and conservation of World Heritage properties. In order to attain a common objective, WHC/LAC favours the implementation of extra-budgetary projects which are consistent with the regional and sub-regional agendas set in the said Actions Plans, rather than an assortment of specific projects. 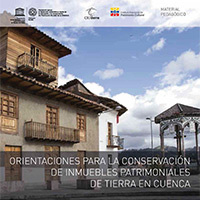 The project “Mobilization of women and youth for the transmission of artisanal techniques to preserve earthen architecture in Cuenca” in Ecuador, implemented in 2015 with the financial support of the Panasonic Funds. The project was implemented by CRATerre under the supervision of WHC/LAC. The overall objective of the project is, to support the initiatives undertaken by the national authorities regarding the conservation of the property, through the social inclusion of women and young people through the enhancement of traditional artisanal techniques associated to earthen architecture. The “Conservation project at the North Acropolis of Tikal” in Guatemala is a project financed by the Japanese Funds-in Trust (JFIT) which will be launched in 2016. It has been elaborated with the objective of stabilizing and consolidating the most vulnerable structures of the North Acropolis while developing a Digital Archive system for the conservation and public education. It will further develop training of the local (technical staff and communities) and propose a conservation strategy for the site. The project will be jointly implemented by the Technical Unit of Tikal (PANAT) and Kanazawa University, under the evaluation of the Vice-ministry of Cultural and Natural Heritage and coordination of UNESCO Guatemala. The transnational project “Support to the reinforcement of the participative management structure of the Qhapaq Ñan, Andean Road System” in Argentina, Bolivia, Chile, Colombia, Ecuador y Perú financed by the Japanese Funds-in Trust (JFIT) which will be launched in 2016. The overall objective of the project is to provide support in the implementation of the recommendations made by the World Heritage Committee at its 38th session (Decision 38 COM 8B.43) for the transboundary serial property “Qhapaq Ñan, Andean Road System” (Argentina, Bolivia, Chile, Colombia, Ecuador and Peru) in order to ensure an effective protection and conservation of the Outstanding Universal Value of the property, including its integrity and authenticity, in line with the principles of the 1972 Convention. The “Project for the preservation and conservation of Tiwanaku and the Akapana Pyramid” was launched at the beginning of 2009 and funded by the Japanese Funds-in-Trust (JFIT) under the coordination of UNESCO Quito. Since its official launching, several administrative and institutional difficulties hindered its foreseen implementation. In August 2012 the JFIT financed an expert meeting at Tiwanaku, in order to establish a new revised project document, including a new work-plan of activities and budget. In 2014 an Advisory Mission to the property took place in order to assist the State Party for the finalization of the Management and Conservation Plan for the property. A second phase on the implementation of the project was launched at the benning of 2016, funded also by the JFIT, under the coordination of UNESCO Quito and the supervision of WHC/LAC. The project “Capacity Building for the conservation and management of Brimstone Hill Fortress National Park, Saint Kitts and Nevis” aims to enhance the national capacities in the field of conservation and management, in particular of military architecture, in order to ensure an effective protection and conservation of the property’s Outstanding Universal Value and to support the conservation and stabilisation initiatives undertaken by the national authorities at the property. The project will be implemented by the Brimstone Hills Fortress National Park Society in coordination with Saint Kitts and Nevis National Commission for UNESCO and UNESCO Office in Kingston. The project “Enhancing Capacities in Small Islands Developing States – Saint Vincent and the Grenadines” aims to enhance the national capacities for the establishment of an integral inventory in both State Parties as required by the Convention. The project will be implemented by the St. Vincent and the Grenadines National Commission for UNESCO and Grenada National Commission for UNESCO and UNESCO Office in Kingston. The project “Support for the implementation of Pilot Projects inscribed on the sub-regional Action Plans for World Heritage in South America and the Caribbean” is financed by the Spanish Funds-in-Trust (SPFIT) in South America and the Caribbean. The project “Towards a sustainable and participative Management Plan for Pantanal” develops a Management Plan through a participative and sustainable process which will enable the stakeholders concerned to ensure a sustainable protection of the property. The project will be implemented by the National Secretary of Culture, Environment and Tourism in coordination with UNESCO Office in Montevideo. The project “Action Plan for Disaster Risk Management at the City of Quito, Ecuador” aims at strengthening risk management planning, with the goal of preserving the Outstanding Universal Value of a property located in a risk challenged area and assist the national authorities in the development of a Disaster Risk Management Plan. The project will be implemented by the Metropolitan Heritage Institute of Quito (IMP) with the collaboration of the National Insitute of Cultural Heritage (INPC) and in coordination with UNESCO Office in Quito. The project “Towards a sustainable community-based tourism strategy in the Valle of Viñales in Cuba” aims at contributing to the community’s empowerment and awareness rising on sustainable and community-based tourism at Viñales Valley through the identification, design, conservation and monitoring of the different modalities of tourism. The project will be implemented by the National Council for Cultural Heritage in Cuba in coordination with UNESCO Office in La Havana.